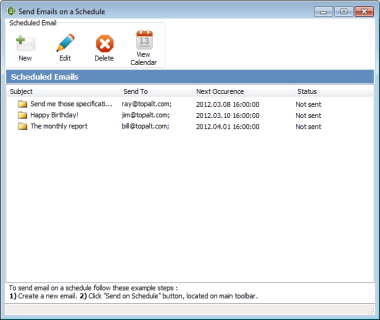 Use ScheduledSend for Outlook to send an email on a schedule (later date). It is a great tool for sending reminders about upcoming anniversaries, birthdays, meetings or other events. Use ScheduledSend for Outlook to send an email on a schedule (later date). It is a great tool for sending reminders about upcoming anniversaries, birthdays, meetings or other events. Use it to send a reminder to your smartphone`s email about upcoming events on the go. Use recurrence option for recurring schedule. Easy preview scheduled emails in a convenient list. Add or remove a space after sentence punctuation in MS Word documents. Word 2000 or higher required. Convert CHM into a set of HTML files using CHM2HTML Pilot. The program supports command line. Using batch mode, you can convert several documents simultaneously. The program has Explorer-like interface. File by OCR automatically names files and places them in a file folder structure based on the document`s OCR text contents. It can extract text from a searchable PDF and name and file it as well, or it can extract the OCR text and build a csv file. This software offers a solution for users who want to extract phone numbers inside MS Excel files. You can specify the length of the numbers you want to extract because different countries have different phone number lengths. Compare two MS PowerPoint files and create a report showing the differences between the two. Save results as text files. PowerPoint 2000 or higher required.